I’m trying to find a way to write about this without it turning into a tirade. Mostly, it seems astonishing to me that some many people are willing to assert the impossibility of things that they have not tried, that other people do, all the time. No sense of embarrassment, not even a nod to the American can-do spirit, as if everyone had decided that their highest ambition in life was to ride on one of those flying couches in Wall-E.
Third in a series, see also safety and density. And understand, this is about what you can do on a bike; if you wanted to do it, if you had a comfortable route for your bike, you could do it. We “need” cars to feel safe in the company of other cars; they may kill us slowly through lack of exercise, but at least we’ll feel safe while we drive them. 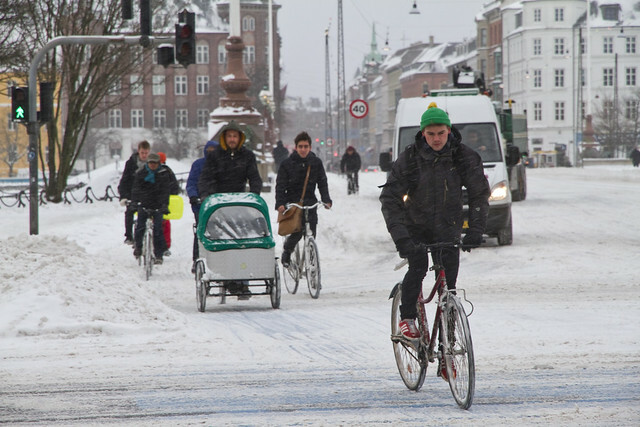 We don’t need cars to carry people or groceries, or to ride in snow, or to ride up hills, or if we are merely not as fit as we once were. So, what can you do on a bicycle? You can ride in cold weather. You can ski in cold weather, right? It’s not much different, except that you don’t need special shoes to ride a bike in the cold, just warm boots. You can buy snow tires for bicycles, with long-lasting studs, that give you adequate traction on wet (“black”) ice. I do this. You can carry other people on a bicycle. Not a racing bicycle, but ordinary people in Europe (ab)use ordinary bicycles and their racks all the time. 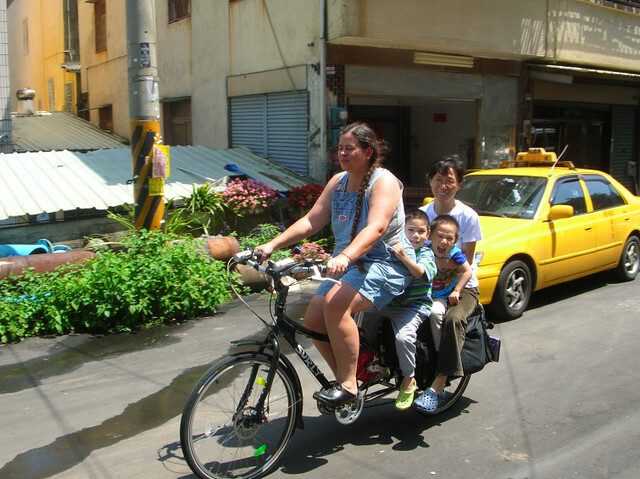 If you prefer to only use equipment in the manner intended, you can get a cargo bike, people carry other people on those all the time. I do this. that’s a CETMA 5-rail rack. 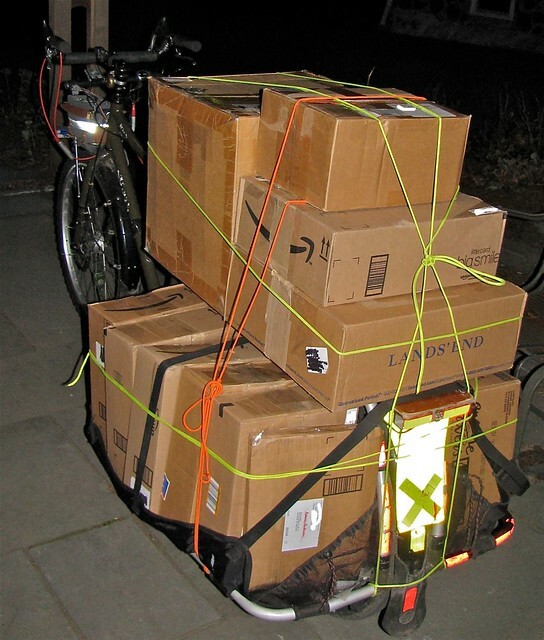 …, but people fit ordinary bikes with large front and rear baskets and racks, and there are various cargo bikes that permit you to carry loads of at least 200 lbs. 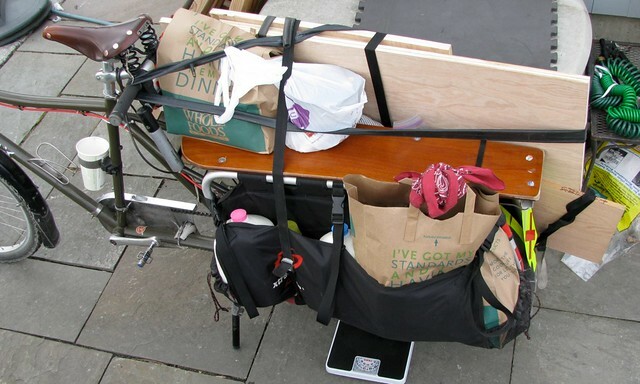 Other people prefer to use trailers, and sometimes carry loads that are difficult to fit on a car. 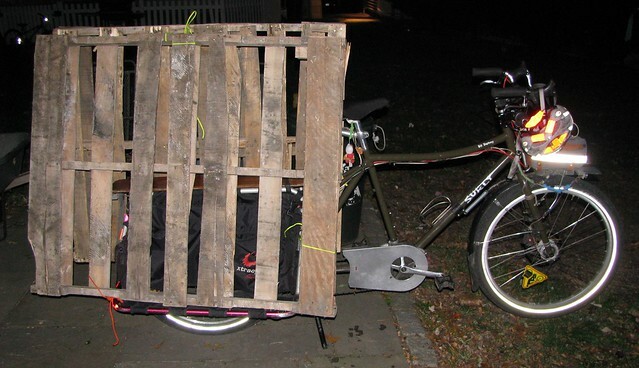 I do this (the cargo bike, not the trailer). See, also, I carried this on my bicycle. You can ride if you are not in perfect health. A friend has a congenital circulatory problem of some sort, that should have killed her as a child, and that has her now with “40% of the CV capacity of a woman my age”. 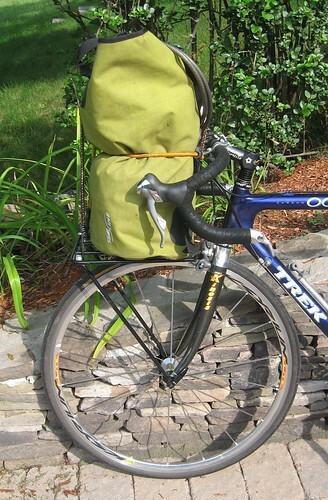 She rides to work, and she rode on a 300-mile tour in Nova Scotia with a bunch of boy scouts on the same bike she commutes on, complete with 7-speed hub and generator light. I know I would be in worse health if I quit riding, because I saw all the check-up metrics move, a lot, after I started riding my bike regularly. When my back hurts (arthritis? ), I ride my bike, it gets better. When my knee hurts, I ride my bike, it gets better. We both do this. If you’re dizzy and have no balance, there are tricycles. If you can’t lift your leg high to mount the bike, there are “step-through” designs. See, also, Cycling Chic with injuries and disabilities. Here’s an astonishing video of a man with Parkinsons riding a bicycle. 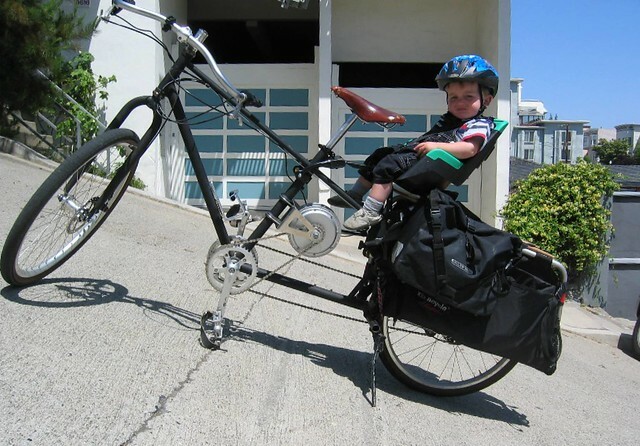 He cannot walk, but can ride his bike as smoothly as you please. You can get an electric motor assist for a bike, if you have horrible hills, or a terrifically long commute, or melt-in-sweat heat, or need to carry large loads. I don’t do this (yet). 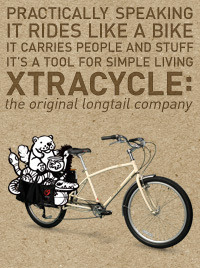 See, also, Cycle9 on ebikes and Stokemonkey overview (both of these are commercial sites, but they have great information there). You can go fast on a bicycle. Commute distance is a problem in some parts of the US, and bicycle top speeds are certainly lower than car top speeds. 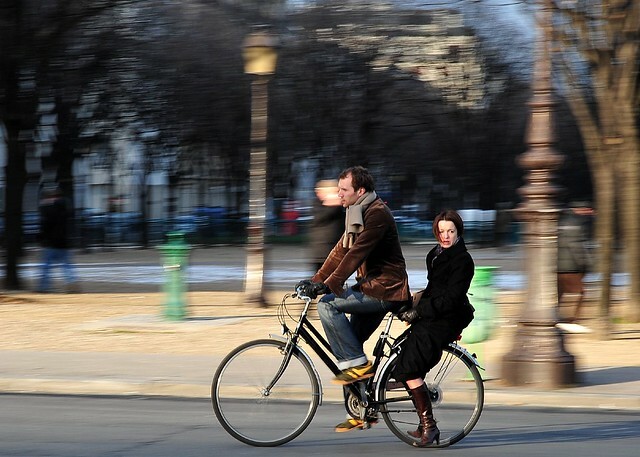 But bicycles can go slower or faster; the primary obstacle to speed is wind resistance. “Racing” bicycles are designed to have excess wind resistance because of an embarrassing contest with a recumbent bicycle in 1933. Efficient bicycles are more banned than drugs in international competition; there are NO recumbents allowed at all, but doping is sadly common. Streamlined recumbents hold the world’s unassisted top speed record (82mph) and the world’s unassisted hour record (56mph). Dutch commuters in streamlined velomobiles have been recorded cruising at over 35mph, and report top speeds exceeding 43mph. 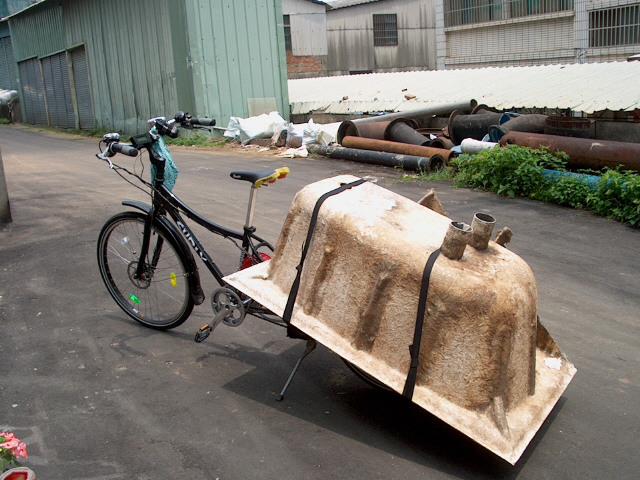 Streamlined recumbents have plusses and minusses; they’re expensive, probably not ventilated enough for a subtropical summer, and aren’t good for hopping curbs, but they go fast, keep the rain off, and have some built in space for personal cargo. They’re an option that fit the needs of some people. I think that we use cars too much. Their convenience lures us away from the exercise that we need; this causes conditions and diseases that are far more deadly than car crashes. This is probably a good fraction of our high health care costs. Cars are also anti-neighborhood; they scare people away from streets, keeping kids indoors, and robbing them of the mobility and independence that is rightfully theirs. It’s impolitic to point this out, but cars are much more dangerous to other people (pedestrians and cyclists) than bicycles are. 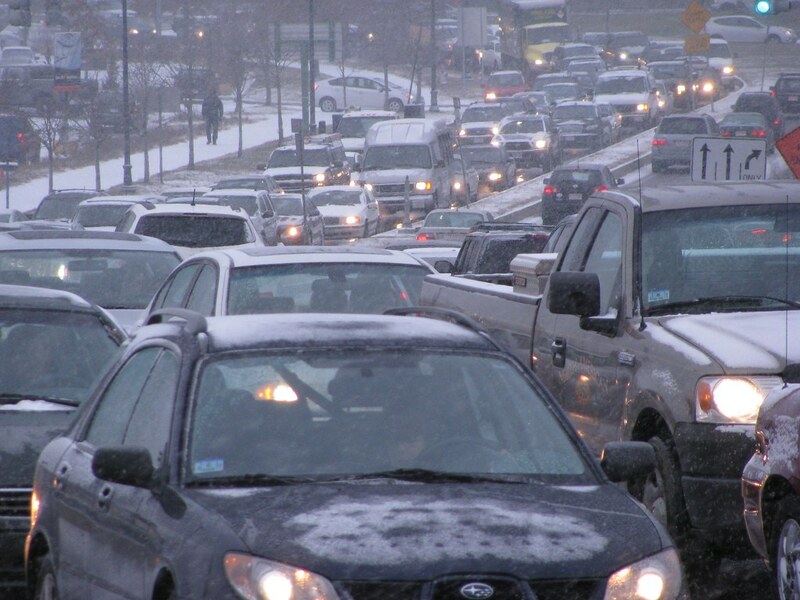 Cars take up too much space, both on the roads, where they cause traffic jams, and when parked. Land is precious in cities, yet we devote a huge fraction of it to temporary car storage. 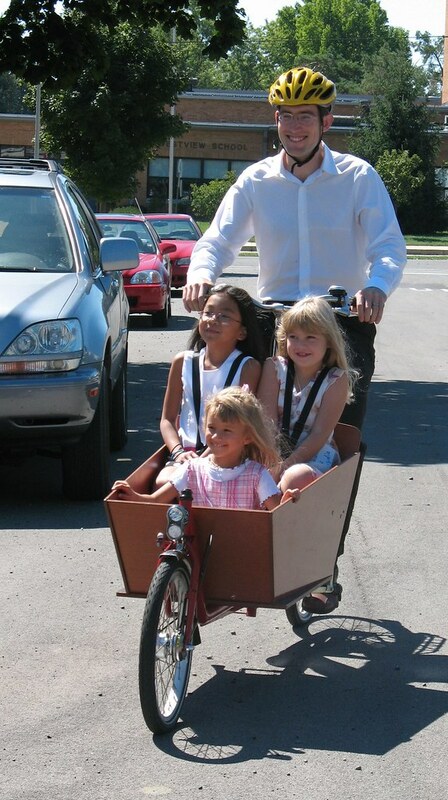 Replacing cars with bicycles increases the density of economic activity, simply because more people can come and go. And even if you live someplace where a bicycle simply won’t work, you should want people in other parts of the country to ride bikes if they can. Fewer other people driving, means more gasoline (lower prices) for you. See, also, John Puchers’s presentation at Simon Fraser University. I love the set of pictures on this post, however, I doubt how useful the “I need an excuse for X” frame is. Folks are driving because it’s easy and normal to drive a car, not because bicycling is too difficult. 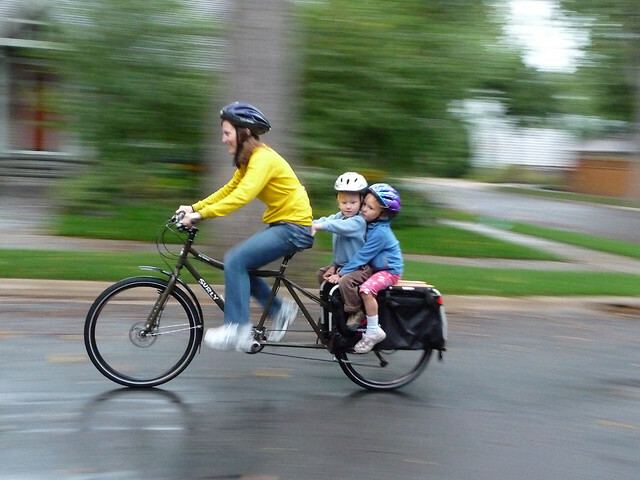 You and I know dozens of people who really enjoy bicycling but who also drive every day. I half-agree, but I’d like to push back a little bit on all the excuses we invent for ourselves. If people get to the point that they realize that they’re choosing to drive only because it’s easy and normal — and not because it is necessary to drive — I’d call that progress. And I drive too, but when I drive, I try to at least have a reason, instead of choosing it by default. Hard to see the functional difference between a line of cars on the Alewife Brook Parkway whose drivers are aware that they are choosing to drive because it’s easy and normal, and a line of cars on the Alewife Brook Parkway whose drivers have no clue that in terms of transportation mode they are mere puppets. I don’t think ABP is a very good example of drivers who are choosing something because they think it is easy and normal. Sucky and normal, perhaps. I think it also will take time; someone who lives in Concord and works somewhere that has them commuting on ABP is very unlikely to bike just because they know it works for someone with a 7-mile commute. Knowing that biking is an option adds value to living closer in where a bike commute might actually work; over time you’ll get more people choosing to live closer in (partly) for that reason.